I repost a lot of articles and tips about how to best grow your social media presence from experts all over the world, but I personally find that the best way to learn how to “be good” at social media is to watch people who are doing it well. One of the people I have been watching grow over the last year in Anula Maiburg of Sixth Street Pilates. There are two things she does really, really well that I believe have helped her grow amazingly over the last year. Authenticity Everything Anula does, posts and says is authentic. Maybe you’ve noticed that fitness posts can all start to look the same after awhile…. a model thin instructor happily doing their thing, showing off some exercises that seem undoable to the average person, and telling you: you can do it too. Instead of trying to fit herself into the typical “fitness” professional mold, Anula is herself and posts about things that are authentically her. 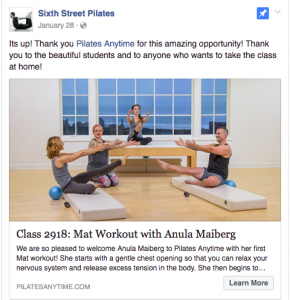 She speaks up about the fact that her body is not a stereotypical “Pilates instructor body” (whatever that is! ), she posts real pictures of her doing the Pilates method she teaches, and she shares honest conversation about working out. Gratitude This quality is huge. I’m pretty sure that Anula responds and thanks to everyone who comments on her posts or reshares her posts (which is A LOT of people these days..) Want to test it? Check her out here and comment on one of her posts to see what happens!! Every time I see her on social media she is saying thank you to her followers. When somebody mentions they took her class online she always writes a sincere thank you! If you post something with her tagged in it she quickly reshares it. Practicing gratitude is something that I truly believe can change how you live your life and it can definitely change your social media presence as well. Anula’s attitude of gratitude shines through in her social media presence and her followers immediately connect with her. They feel listened to, they feel appreciated and they continue to follow and interact with her. It seems so simple really, but very effective. Try out these two tips for building your social media presence and be sure to let me know how it goes!! Previous Post: « The Perfect Assistant!